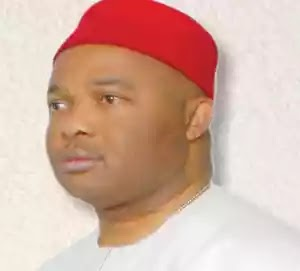 The Special Presidential Investigation Panel for Recovery of Public Property, SPIPRPP, on Monday, said it granted administrative bail to the governorship candidate of the All Progressives Congress, APC, in Imo State, Senator Hope Uzodinma, after he developed high blood pressure in detention. Uzodinma Chairman of the SPIPRPP, Chief Okoi Obono-Obla, who confirmed Uzodinma’s temporary release on bail to Vanguard, said the lawmaker pleaded to be allowed to return back for questioning on Tuesday. Obono-Obla told Vanguard that the embattled APC gubernatorial flag-bearer, who was accused of complicity in $12million contract fraud, was released from detention around 12midnight on Sunday. “We don’t want him to die so we have granted him an extension till tomorrow (Tuesday) to report to us”, Obono-Obla stated, adding that the initial agreement was for the accused lawmaker to report back around 10am on Monday for further grilling. He said: “Yes we granted him bail to report back today and this morning he was supposed to return by 10am but he requested for us to adjourn the matter till tomorrow that his blood pressure went up. “We don’t want him to die so we have granted him an extension till tomorrow (Tuesday) to report to us. We will wait for him, if he doesn’t come as we agreed before we granted him bail, then we will know what to do”. On Uzodinma’s alleged denial that he was never arrested by SPIPRPP operatives upon his arrival in Abuja from Lagos, aboard an Air Peace, Obono-Obla said: “Well you know that no one will say that his mother’s soup is not sweet. The man was arrested. If not why is he begging for extension till tomorrow (Tuesday)?. “He was arrested yesterday at the airport about 8:30pm by our operatives and he was kept there till about 12midnight before he pleaded that he should be allowed to go and we conceded because we don’t have detention facility. “We don’t detain people as a matter of policy in our panel. But we asked him to report back by 10am today. “When we did not see him by that time, we went to his house and laid siege there. It was then he started pleaded that he was not feeling well and that he will report to us tomorrow. “So we granted him that respect. If he fails to report tomorrow then we will take it up. We have already filed charges against him for refusing to declare his assets.this matter has been lingering for the past two years. “He has tried to play some politics but we are not politicians and we have nothing to do with the politics of Imo state. But this matter has been lingering since 2017 that we started looking for him. He refused to answer our invitation. “We sent about two invitations to the Clerk of the National Assembly but he did not come. “So we went to his house and pasted our assets declaration form. That is the first step in our investigation. He refused to fill that form within 30 days as prescribed by the law establishing our panel. “We now charged him before the Federal High Court. That one is pending. So if he said he didn’t arrest him, then it is up to him. But nobody will say that his mother’s soup is not sweet”, he added. The Presidential Panel chairman equally confirmed that Uzodinma is facing investigating for allegedly engaging in economic sabotage owing to failure of his company to execute a contract of $12m the Nigerian Ports Authority, NPA, awarded to him for the dredging of Calabar channel. It will be recalled that the SPIPRPP had earlier preferred two-count criminal charge of non-disclosure of assets against Uzodinma before the Abuja Division of the Federal High Court. The charge, which has been assigned to trial Justice Babatunde Quadri, read: “That you, Senator Hope Uzodinma (Male) on or about March 5, 2018, being a public officer with the National Assembly, Abuja, within the jurisdiction of this honourable court, committed an offence to wit: refused to declare your assets without reasonable excuse and upon notice to declare your assets before the Special Presidential Investigation Panel for the Recovery of Public Property, Abuja, contrary to and punishable under Section 3 (3) (1) (a) of the Recovery of Public Property (Special Provision) Act 2004.